The robot uprising must surely be close at hand, as Ivy League scientists are diligently working to give machines the ability to collaborate with themselves without intervention from the humans. 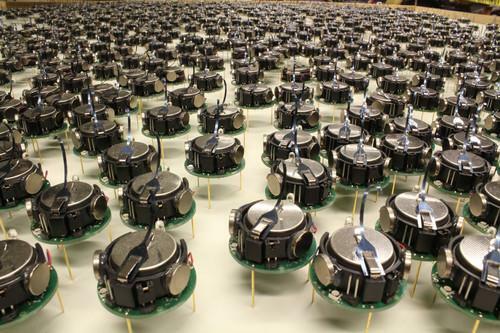 A group of researchers at Harvard University has figured out a way for thousands of robots to coordinate their actions so that they can complete a single task, such as arrange themselves into a star formation. The work, led by Harvard School of Engineering and Applied Sciences' computer science professor Radhika Nagpal, is part of an ongoing effort to investigate ways that machines can mimic biological processes, using AI (artificial intelligence) algorithms. An article about the research is in this week's issue of Science. The researchers built 1024 small, mobile, three-legged machines that can move and communicate with one another using infrared laser beams. Humans can issue a command to the robots, such as telling them to form into a sea star or the letter 'k,' and the bots will coordinate with each other and arrange themselves into the desired pattern. The idea is that just as simple organisms can work together to a complete a task, so too should machines be able to self-organize to complete a task, without the detailed instructions from a single master controller. "The beauty of biological systems is that they are elegantly simple -- and yet, in large numbers, accomplish the seemingly impossible," said Nagpal, in a statement. "At some level you no longer even see the individuals; you just see the collective as an entity to itself." Such collective coordination can be seen all across nature, the researchers said. A colony of army ants can create rafts and bridges to traverse a body of water. Starlings can join in a flock to travel thousands of miles. Individual cells come together to make larger forms of life, such as plants and animals. Key to the robots' collective autonomous behaviour is a set of AI algorithms that allow the robots to coordinate their actions with one another without the need for intervention. Such algorithms could one day be used as the basis of semi-autonomous software and devices that wouldn't need explicit input for each step. With this experiment, each robot gets an image of the shape to be formed and they take turns moving into an acceptable position, based on finding the edge of the group and avoiding any traffic jams that may occur. No robot has a bird's-eye view of the proceedings, which means they must coordinate with one another. Nor do they possess an extraordinary amount of processing power, so they must rely on coordination with other bots. Watching the robots self-organise is not unlike watching birds assemble into a flock, the researchers note. The design of the robots, called Kilobot, is available as open source at no charge, for noncommercial use. Robot manufacturer K-Team also offers Kilobots for purchase. The U.S. National Science Foundation and Harvard's Wyss Institute for Biologically Inspired Engineering helped fund the work.